Pad thai from the street stands of Bangkok is easily one of the best food bargains in the world! I felt sort of guilty for all the work these people went through to earn less than $1, but 25 – 30 baht was the going rate for a vegetarian pad thai consisting of noodles, cabbage, mung bean sprouts, fried onion, peanuts, and egg. How do they turn a profit? Street food isn’t for everyone. 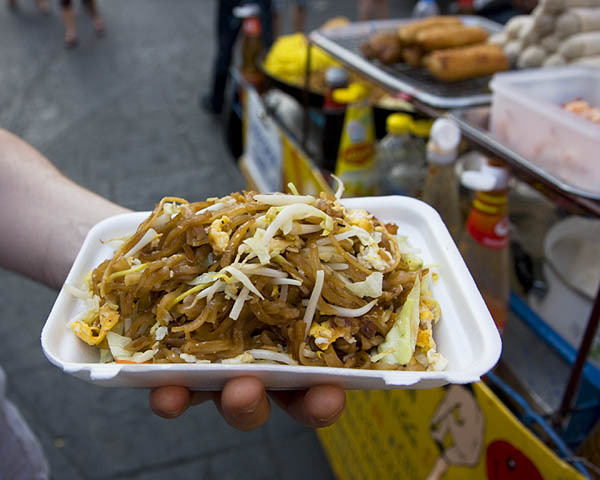 Corners are cut; for example, street pad thai often uses soy sauce in place of fish sauce, and vinegar in place of tamarind. There are cleanliness and food safety issues to consider. And it can be awkward to walk or sit on a curb and eat, but street dining is one of my favorite travel experiences! 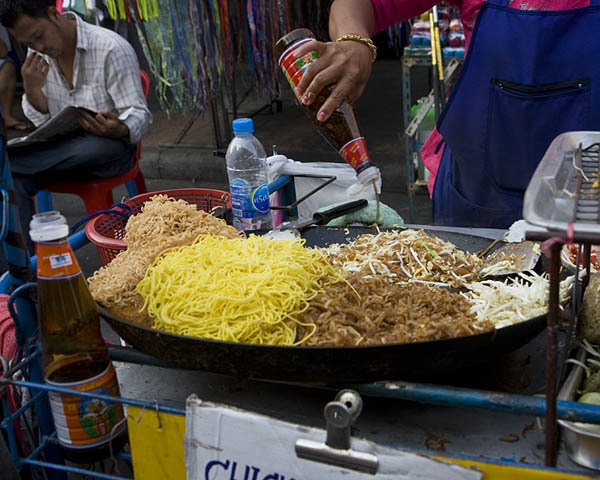 Pad thai is traditionally made with rice noodles, but this another area in which the street vendors cut costs. Still, most offer a choice of 3 different types of noodles and the pad thai is still much better than anything I’ve had outside of Thailand. Sounds divine! But I’m curious about the relationship between pad thai and what appears to be a drawing of a woman putting on her undies (on the sign in the first photo)? I have no idea, but I have many more examples of signs that just don’t completely make sense. 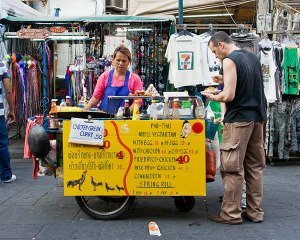 This stand was on Khao San Road, an area popular with backpackers and full of street vendors. A few of the vendors do a brisk business in cheap undies, so maybe the pad thai owner thought she could tap into that market by putting a half naked women dealing with undies on her sign? Soon, I’ll post the recipe I learned in cooking class. I think it’s pretty good. In the meantime, I’ve been wanting to give this one a try, but I can’t find tamarind here, hopefully it’s more readily available in your area. I’d use brown sugar for the palm sugar and light soy sauce for the fish sauce (to keep it veggie).